Professor of paleoanthropology at Texas A&M University in the U.S.
My research focuses on human evolution in the Middle and Late Pleistocene. I look at patterns of morphological variation within and among populations of this time period to understand the evolutionary history of our own species, Homo sapiens. I have explored questions of phylogeny and systematics using quantitative assessments of craniofacial morphology, and use the results to understand which evolutionary forces, including population dynamics and interactions, shaped regional populations of H. sapiens. For several years I conducted work in Gujarat, western India surveying sites associated with the Toba volcanic super-eruption. This research, funded by the National Science Foundation and the National Geographic Society, focused on paleoenvironmental reconstruction of western India before and after the eruption. 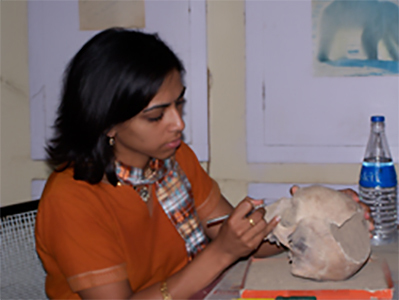 I have also participated in the Narmada Basin Paleoanthropology Project in the central Narmada Valley of Madhya Pradesh, in excavations at Lower and Upper Paleolithic sites in France, and at a Harappan site in western India. I have also conducted research in museums throughout Europe, Asia, and Africa looking at the original fossils of most Middle Pleistocene specimens. My current research is an NSF and Wenner-Gren funded project examining the burials from the Bhimbetka rock shelters in Madhya Pradesh, Central India. This is a UNESCO world heritage site initially excavated in the 1970s and 1980s by the late V.S. Wakankar of Vikram University. I am working with a multidisciplinary team to reconstruct early Homo sapiens evolution in India using a combination of morphological, genomic, and archaeological data. Our work aims to decolonize the study of our evolutionary history by moving beyond the “Out of Africa” model and building regional models, using local voices and data, that are more appropriate for South Asia. Related to this, I teach and publish on critical issues of voice, inclusivity, diversity, representation, and postcolonialism in science more broadly, and biological anthropology specifically. It is a timely needed lecture program for us now days as we have engaged in conforming one of the living areas of Homo Erects man in Sri Lanka ( in the North- Iranaimadu Cultural Basin). Recently we collected Atchulian type of Hand axe from Valikamam area in Jaffna. We also have already collected stone Hand axe from Mayakkai in Point Pedro. I hope Dr Nimal Perera will conform this with this lecture program.